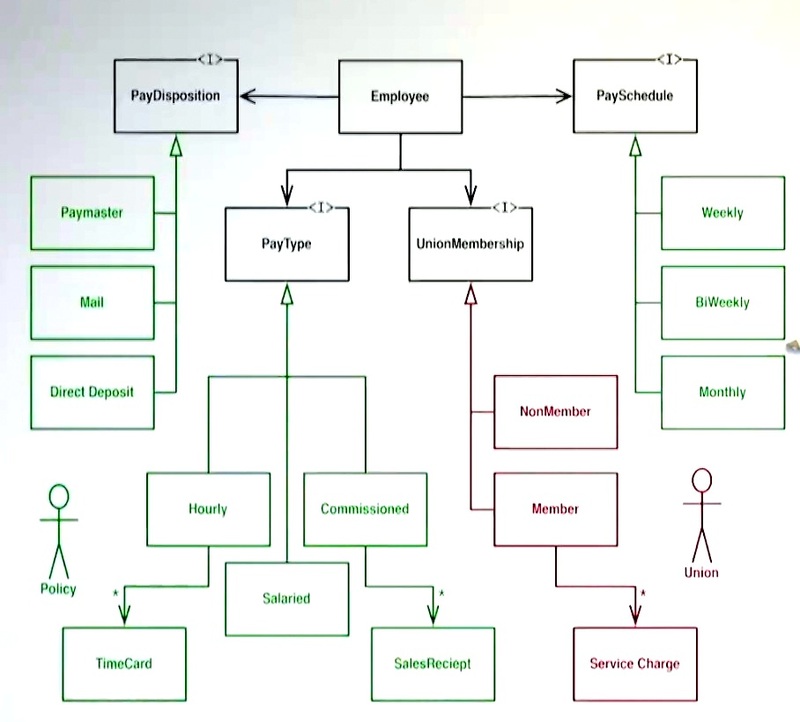 This is my implementation of Robert C. Martin’s Payroll-Case-Study learning project presented in his book Agile Software Development, and in his videos on cleancoders.com. 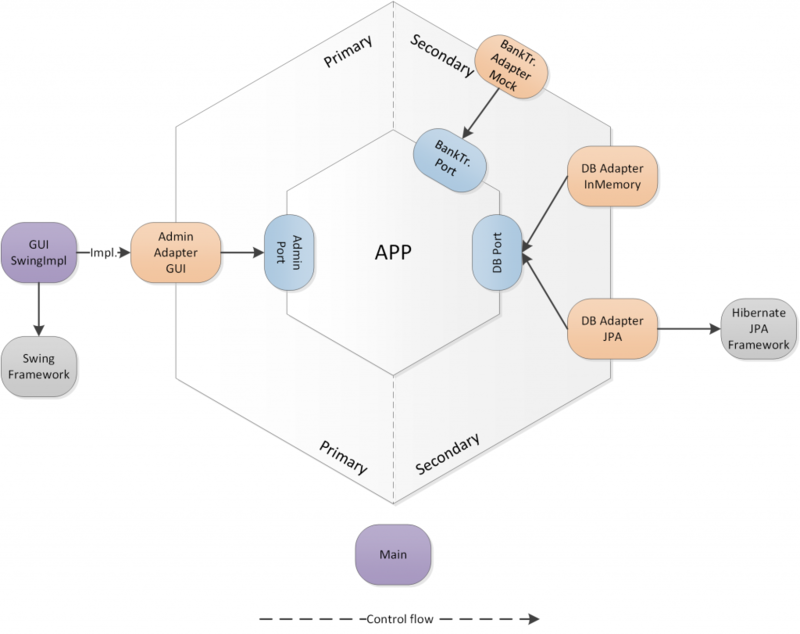 The clean architecture separates concerns of the application in a scalable and maintainable way. My architecture is based on hexagonal, and clean architecture. 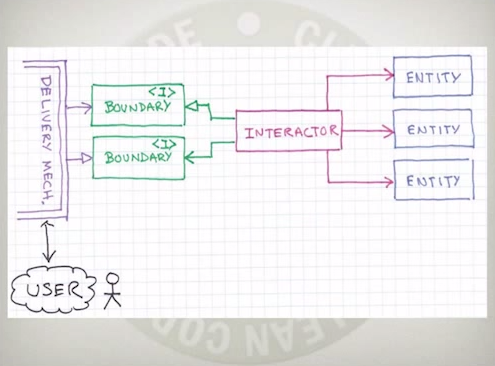 Ports are the boundaries of the app: interfaces and DTOs. Outside of the adatpers are the frameworks, drivers. All the dependencies pointing towards the center, and nothing on the opposite way. Entities are not the same as JPA Entities, they are high level business rules, policies, and should be independent from any other concerns. Probably this is not a perfect solution, I departed from Uncle Bob’s recommendations at some points. 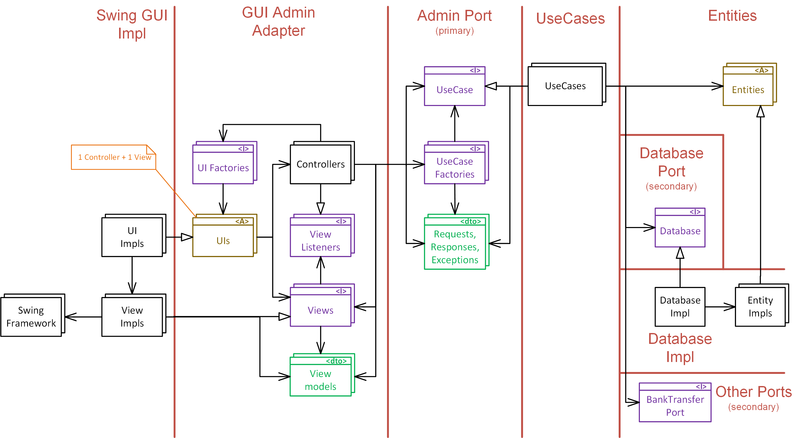 I introduced UI abstraction that encapsulates a view and a controller, to provide a single interface for this relation. I didn’t used builders for data structures (request, response dto­s), so i just put them to the ports layer together with interfaces. I used Guice DI in several modules, but only(!) outside of the Boundaries (Ports). There are Unit Tests only for Entities, and Integration tests (testing usecases) in Main module. I used a proxy mechanism implementing entity gateway for JPA. 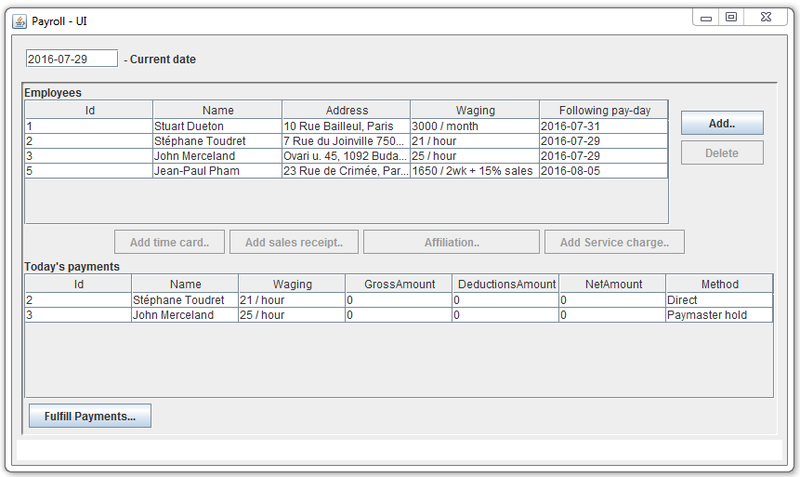 In Main class it is selectable to run with JPA, or InMemory database. This example has configured JPA with hsqldb, so no database needed to test it. Mine is similar, but I have always had a doubt with it… why ports are always draw in the boundary of the domain (usecases implementation + entities), and it is said that dependency points inwards (i.e. ports should depend on domain and domain on nothing), whereas the reality is that ports are “inside” (domain depends on ports and ports depends on nothing). Dependency points inwards from adapters to ports but not from ports to domain. Another issue wich I’m struggling with is defining a generic search method in the database API with a generic predicate (generic search criteria) and how to convert that generic predicate (which is implementation agnostic) to JPA implementation (I use querydsl predicates). Finally I’ve decided not to put a generic search method, but to put a concrete method with the concrete search criteria in the specific database method for the concrete entity. How do you deal with this? 1) Ports: I’m not sure what you mean, in my project Ports are dependent only on Entities (domain), easy to check in pom.xml. 2) Generic search: I’m not clear what you want exactly, but you can define search methods in Gateway interface, then you can implement for JPA, Memory, case by case. Within JPA implementation you can use Criteria or Hql or whatever JPA tool, or even concrete db queries if you decide to fix the database provider of your JPA implementation, this does not effect the architecture. Of course those methods should be implemented for Memory version also in a different way. I guess this answer is not so helpful, I could understand better if you provide some example. So adapters depend on ports (which is ok), but ports don't depend on App. App depends on ports, which isn't supposed to be the right thing seeing how they always draw the hexagon (ports in the boundary of the hexagon and app inside). It is supposed that ports depends on the inner of the hexagon. I've been thinking that in order to acheive that, I have to move the usecases implementation from the "app" module to the "primary port" module, but that would break the rule that ports are just interfaces with no implementation. On the other side, to make secondary port depends on app, I would have to add another interface to the app , and let the secondary port just "extends" it, but that's a little bit tricky. Another "problem" is where to place the entities… if you place them in the app (the inner of the hexagon), like you do, then the secondary adapter depends on the app, and that's not ok because it "jumps" the port (the boundary of the hexagon)… secondary adapter should only depends on secondary port. I've place them in the secondary port, but it isn't correct neither. They should be in the inner, and the secondary port "extends" them (another tricky workaround). Oops! wrote too much, another day tell you about generic search, I don't wanna be boring. Yes, because I prefer tree structuring more than other people. 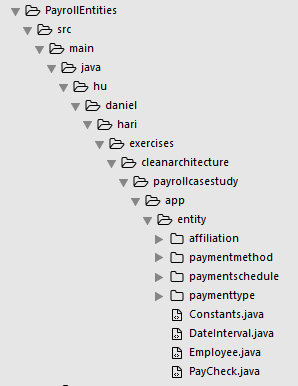 And if you use another IDE, like Eclipse, the empty tree sequence will be flatted so you don’t have to climb it. Great post. I do have one question. According to Uncle Bob’s Clean Architecture, the database implementation is supposed to be the outer most later. Assumption is the outer the layer the more detail, the inner the layer the more abstract. Database implementation is something that can change (i.e. replace SQL with another DB), hence he thinks should sit on the outer layer. Where as business logic doesn’t change often so it should sit in the inner layer. Any reason why you have the DB implementation in the entity layer? if you were to put it on the outer layer, how do you suggest the implementation would be? thx. Now i see that it is the outer layer. 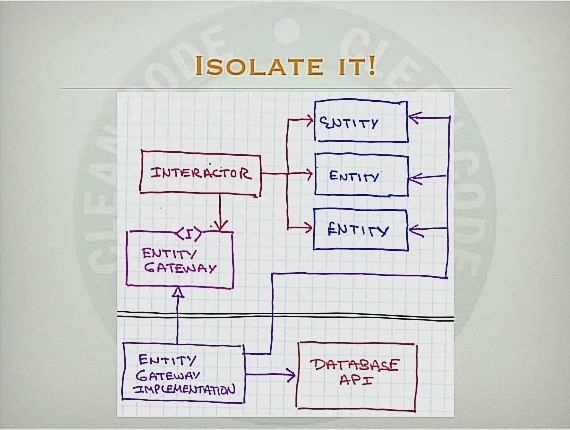 One more question – could you please explain the relationship between “Database Impl” and “Entity Impls”? Because I do see that Entity Impls is connected to Entities. P.S. I also see an arrow connected from Use Cases to the Database Port. 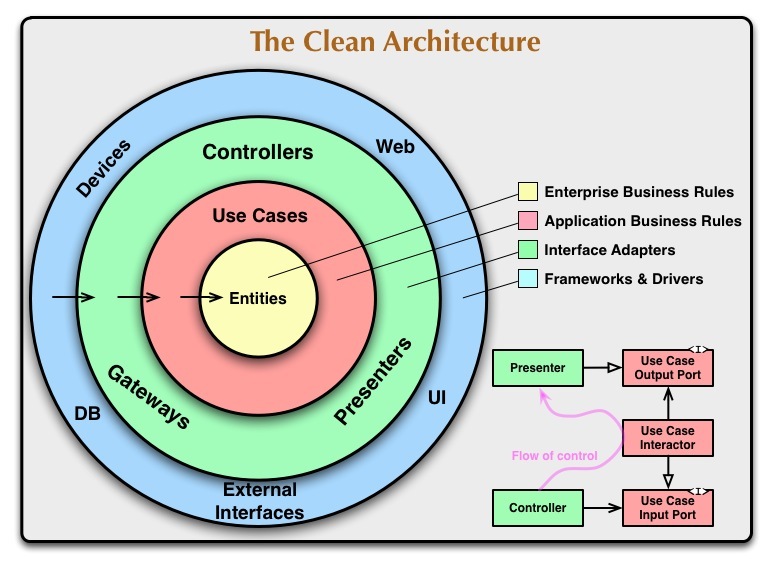 I guess what I am confused with “The Clean Architecture” is that, how can the database layer (outer layer) “calls” the controller layer? 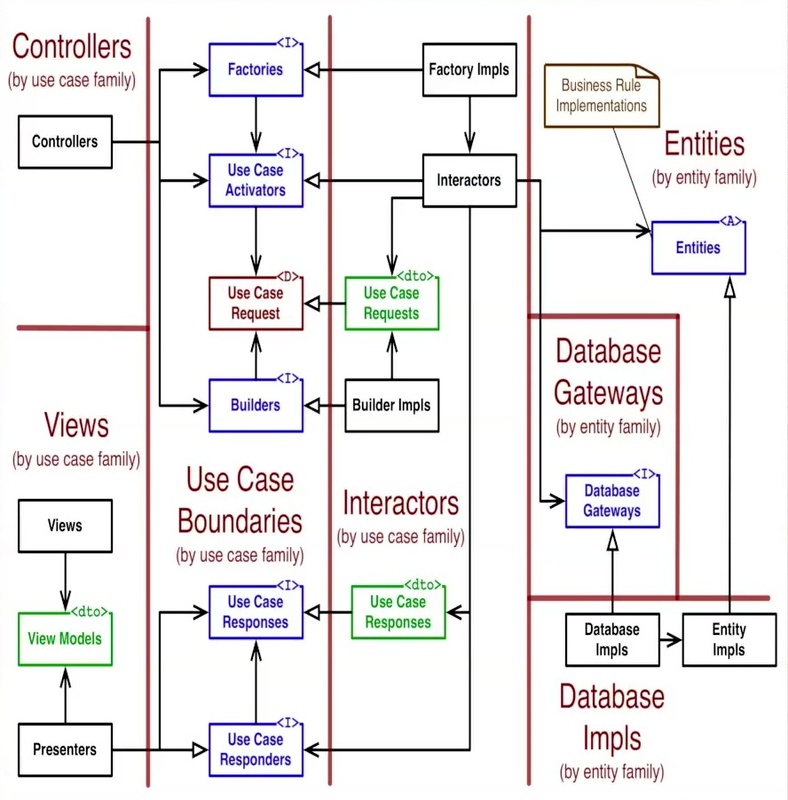 In a practical software situation, a running program needs data from the database, the driver of the program (controllers) would make database call to access the database, but his design is suggestion the database layer calls the controller (which in turn calls business usecases/entities). 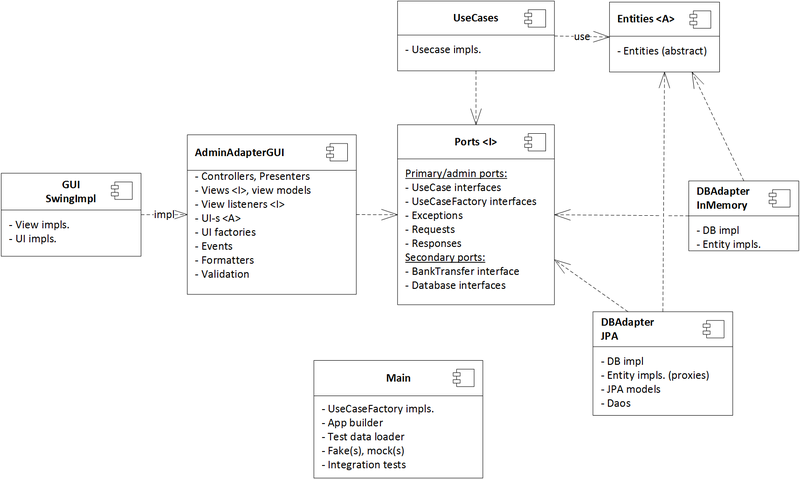 – Use cases are calling the database abstraction and entity abstraction (but no reverse calls). “Database impl” and “Entity Impl” are concrete implementation classes like MemoryDB or JPA-DB, Database creates the Entities to provide them as a result for the calls from the use-cases.